Beautiful watch that looks great on the wrist. The watch is fairly light so it doesn’t weigh down your arm. It has a versatile look; can be worn casually, with business attire, or dressy. It’s a great “go to” accessory for just about any outfit. This user was entered into a sweepstakes after submitting their honest review. 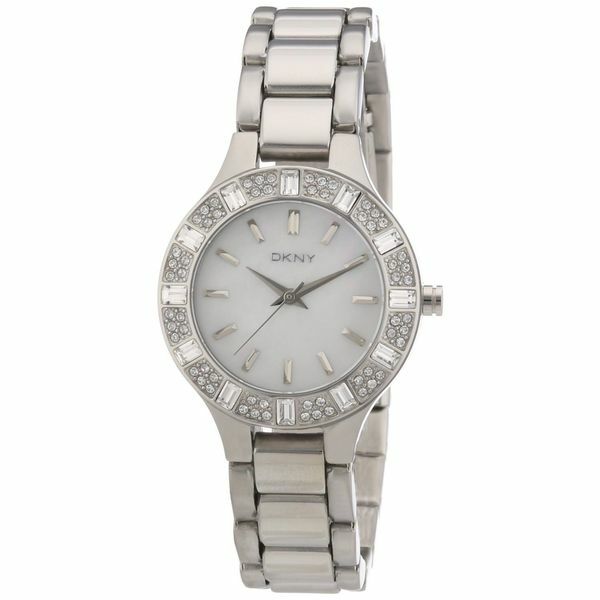 Brilliant cubic zirconium stones accent the bezel of this DKNY Glitz watch. This watch is finished with a Mother of Pearl dial and a stainless steel bracelet. I bought this watch as a birthday gift for my grand daughter. I let her pick it out and she loves it. It arrived to my home a few days before expected which was great for me. Beautiful watch that looks great on the wrist. The watch is fairly light so it doesn’t weigh down your arm. It has a versatile look; can be worn casually, with business attire, or dressy. It’s a great “go to” accessory for just about any outfit.